GRACES performs high-resolution echelle spectroscopy between 400 and 1,000 nm. It is offered in two spectroscopic modes. 1-fiber (object-only) mode, in which we only collect the spectrum of the star and neglect that from the background sky. The image of the single fiber is sliced in 4 at the spectrograph entrance, which provides a maximum spectral resolution of R~67,500 (as measured during phase I commissioning). It is the recommended mode for brightest targets (V<19 mag) that outshine the sky background. Note that for data reduced with Opera, the resolution attained for 1-f mode is 61-65k, highest in the range 600-850nm, while data reduced with DRAGRACES have an average resolution of 55k. 2-fiber (object+sky) mode, in which the spectrum of the star and of the background sky are recorded simultaneously on the CCD (with orders interleaved). The image of the two fibers are sliced in 2 each at the spectrograph entrance, which provides an average spectral resolution of R~40,000 (as measured during phase I commissioning). 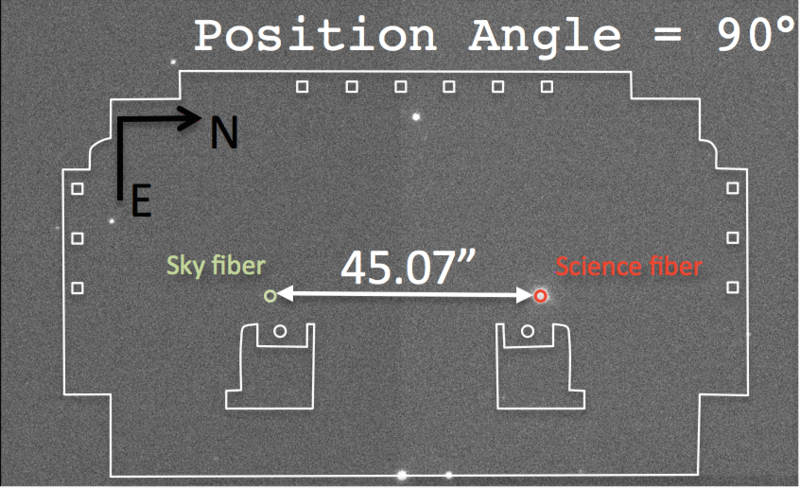 Note that you may want to orient the "Sky fiber", using the instrument Position Angle, so it does not fall on another source. The image below shows how the "Science" and the "Sky" fibers are oriented. Also note that the resolution for Opera reduced spectra is ~36-40k with the highest resolution between 650-900nm, while data processed processed with DRAGRACES have a resolution ~37k. "Science target. If PA=0°, then the "Sky" fiber is towards the East. Most of the "work" is done by the ESPaDOnS spectrograph. The Gemini user has to choose a spectroscopic mode, and to prepare the acquisition. The acquisition is done using GMOS imaging mode. See the following pages for more details.